LEE CHING WEI was your typical high-flying Malaysian graduate working in Melbourne. Holding an enviable position as a financial adviser and investment consultant in an investment bank there, Lee spent eight years in Australia, lavishing in the laidback lifestyle. In early 2012 however, he found himself starting to long for home — the food, family, friends — and it pushed him to take a leap of faith. He quit his well-paying job and came home to start a business with all his savings. Back home, though, Lee found he had to overcome the gargantuan task of identifying which banks offered the best rates, which credit cards best suited his needs, and which loans would work to his advantage. While comparative websites were nothing new in Australia, it was non-existent in Malaysia, or in the region (except for Singapore). It was a light bulb moment, and Lee soon set his sights on starting his own website: iMoney — a tool which could help millions of Malaysians with financial advice. Lee met old school friend Ng Khai Lee, the man who brought Groupon to Malaysian shores, who became one of iMoney’s first investors, and Portuguese national Bruno Araujo, who is now iMoney’s group chief revenue officer and co-founder. Together, they built the website from scratch, and Lee found himself becoming the “everyman” — salesperson, researcher, social media officer and website content creator — all to save money on having to hire staff. “I started iMoney because I realised that I would prefer to do something that would impact people. Unlike Australia, where I was an investment consultant and was therefore impacting numbers, iMoney enabled me to make a contribution to society by impacting people,” Lee told The Edge Financial Daily. Two years ago, when the company was started, Lee could only find an online advertising presence in two of the dozens of banks in Malaysia: Citibank and Standard Chartered. While the banks’ online presence has increased significantly within this time frame, they’re still lagging greatly behind those in Western countries. A one-stop for everything you need to know, iMoney has basically become the TripAdvisor of the financial world. It puts together information gathered from banks on loans, credit cards, insurance, bank accounts, and even mobile phone providers’ phone plans so people can compare them simultaneously. iMoney speaks to banks and channels potential customers to them, therefore eliminating salespeople that banks usually need to sell their products and earn a commission in return. For some products that offer full service, specialised staff at iMoney contacts customers, help them out with loan paperwork, and then puts in their applications directly to the banks. All the customer has to do then, is have their financial documents ready and wait for another phone call from iMoney. “Consumers like comparison tools. They want to know what is best for them ... tabled and tallied neatly instead of having to approach a myriad of entities like banks to figure out which product works best for them,” Lee explains. For complicated products like home loans and insurance, consumers get a very simplified version of the application process through iMoney. Instead of applying for a loan at individual banks, iMoney’s staff streamlines this process by helping the consumer find a best suited loan, getting documentation and paperwork done on their behalf, and finally sending the application in to the bank. Being the forward-looking entrepreneur that he is, Lee soon figured that iMoney should tap into the Southeast Asian market before someone else did, and so entered the Indonesia, Hong Kong, the Philippines and Singapore markets. To build a sense of belonging with these markets and to tailor it further for the consumers, iMoney uses the local languages of the countries that they currently have a presence. 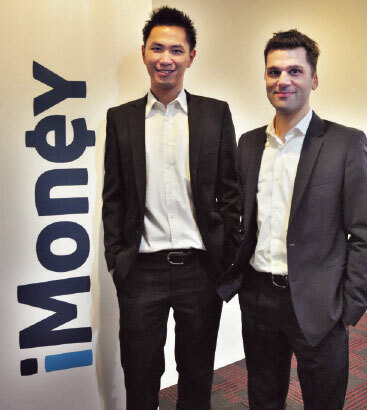 In the near future, iMoney has set its sights on entering the Thai market as well. In September 2014, iMoney secured RM13 million in investment from Australia’s leading online comparison service, iSelect, who was looking into penetrating the Asian market. Armed with more “ammo”, iMoney is looking to expand their end-to-end service (currently limited to loan products whereby consumers are assisted by staff through all the application steps) to all other products including credit cards, insurance, or mobile phone plans. “Basically, our principle is that we are our own biggest competitors. We aren’t that gung-ho about finding out what our competitors are doing; we’re here to challenge ourselves. The only thing that can stop us from moving forward is us, not anyone else. We want to focus on what the customers and consumers are saying,” said Lee. “In the near future, we have in place some plans to expand on our advertising — to get onto television, in mainstream media and the like. Our goal is to increase our monthly traffic up to five million visitors, which I think is very doable. We want to be the one source for trusted financial advice,” he said enthusiastically. Imagine a financial marketplace where consumers will no longer have to deal with salespeople — all of whom are trying to upsell their products — and instead get to rely on an unbiased, trusted source such as iMoney, which is completely free to use. Doesn’t it sound like a revolution in this sometimes hesitant industry? Lee and his team obviously think so, and because of that, they are helping to usher in a brand new age of control that you and I get over the financial products that we use on a daily basis. And that goal, is nothing short of outstanding. Lee (left) and Araujo are planning to see iMoney expand its monthly traffic to about five million visitors in the near future. This article first appeared in The Edge Financial Daily, on November 11, 2014.